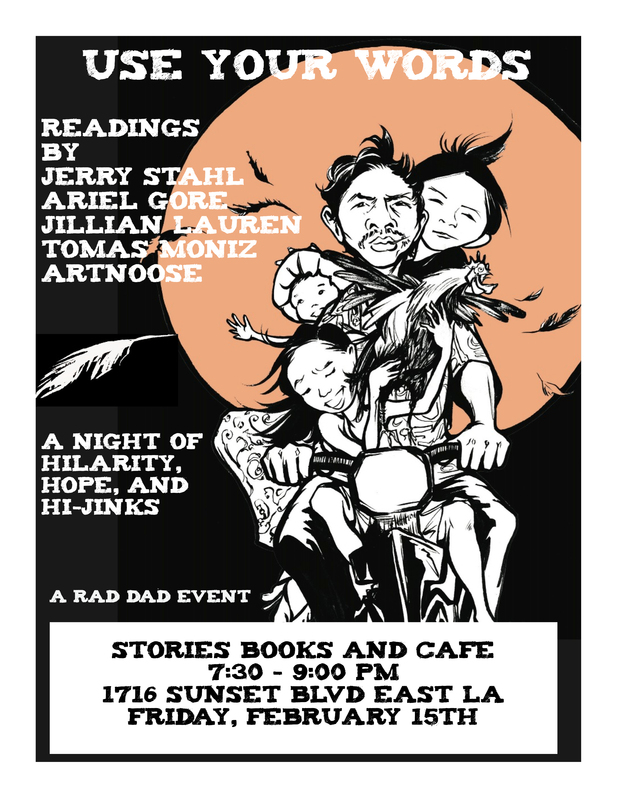 In town for the LA Zine Fest, long time zinesters Artnoose, celebrating her 100th issue of Ker-bloom, and Tomas Moniz, editor of Rad Dad and other zines, have teamed up with literary superstars Ariel Gore, Jillian Lauren and Jerry Stahl for an evening of storytelling filled with hilarity, hi-jnks and hope. Artnoose has released an issue of Ker-bloom every two months for the last 16 years! Tomas Moniz edits and writes for Rad Dad, a zine on radical parenting, hosts two literary events in the Bay Area, and performs regularly. Ariel Gore is founder of Hip Mama. Her newest work is The People’s Apocalypse. Jillian Lauren is Los Angeles based writer of Some Girls: My Life in a Harem. Her newest work is Mother Tongue. The event will take place at Stories Books and Café in Echo Park (1716 West Sunset Boulevard, Los Angeles, CA 90026) from 7:30 – 9:00. It’s free to the people! This is a great all-ages event for those that can’t attend the LA Zine Fest Reading & Rock Spectacular the following night. To RSVP check out the Facebook event page!